This one is probably the most obvious, but wearing a heel will always elongate your legs. Now this doesn’t mean that you have to stock your closet full of sky-high, 6-inch heels. Even a 2- or 3-inch lift will give your legs a longer and leaner look. I’m a big fan of the high heels from Lauren’s Kohl’s line. They’re super comfortable and take my legs to new heights the moment I step into them. While there are times when you want to wear a bright pink pump, if you’re looking to elongate your legs you should lean toward neutral shoes that match your skin tone. It’ll make your heels disappear into your legs, thus making your legs look longer. You can also create this illusion by matching your shoes to the color of your pants. Whenever I wear black pants with my favorite pair of 3-inch black booties, my legs look so much longer than they actually are. When trying to get the look of longer legs, opt for a high-waisted skirt or high-rise jeans. Because these styles create a higher looking waist, you’ll automatically get the illusion of longer looking legs. Luckily for us, there are endless styles of high-waisted skirts and pants out there… My current favorite is this cute little number from Nasty Gal. Lucky for us, the monochromatic look is totally on trend and it will make your legs look longer. Wearing an outfit that’s all one color will extend your entire silhouette, giving your legs that runway-ready look. The darker the outfit, the longer your legs will look, too. A little extra glow will make any set of stems look longer and leaner. Whether it’s rubbing on a bit of highlighter or using a self-tanner, if your legs have that bronzed finish they’ll immediately look a lot longer. I like this self tanner, but my favorite product for glowing gams is the Michael Kors Leg Shine Collection. Just roll it along your legs before you head out and you’ll get a sleek, shimmery glow that elongates those legs right away. Bonus tip: Also, avoid ankle straps when possible if you’re going to for longer legs. They tend to cut your leg off at the ankle and give you the opposite look you’re going for. 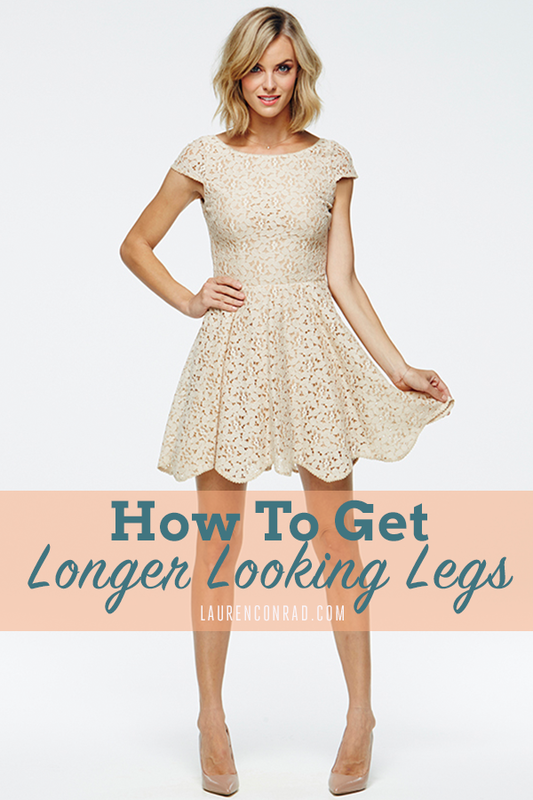 Do you have any other tips and tricks to get longer looking legs?